How to Get from Lisbon Airport to Lisbon City? Visiting the capital of Portugal, Lisbon soon? Most likely you will arrive at Lisbon Airport (LIS). Unless you know someone in the area you will certainly require a ground transport to your hotel or other accommodation in the Lisbon centre. If you want to avoid all the hassle of catching a public bus carrying your luggage around in the busy city, your best option is to book online a private Lisbon airport transfers to the city centre. Select Lisbon City as your transfer destination area and provide us with flight details, Lisbon City accommodation address and contact. We automatically process your request for transport availability to Lisbon City and send a booking voucher with your transfer confirmation in a matter of seconds. At Lisbon Airport arrivals terminal a friendly driver will be waiting for you next to a placard with our website logo. For the return transfer we will pick you up from the same address in Lisbon City. And remember, you can always pay later to the driver for both your arrival and return Lisbon City transfer. How far is Lisbon City from Lisbon Airport? How much will it cost? How long? The travel distance between Lisbon Airport and Lisbon City is 15Km and transfer time takes approximatly 15mins under normal traffic conditions. Looking for an easy, fast, affordable and hassle free alternative transport to downtown? We provide taxi transfers service from Lisbon airport to any hotel or private accommodation in the Lisbon area. Booking with us you will have a friendly driver waiting at the airport arrivals hall, he will assist you with all the necessary logistics and guide you to your assigned transfer vehicle which may vary from an executive saloon or estate car for up to 4 passengers, a modern people carrier van or mini-bus up to 16 passengers or a large bus up to 27 passengers. Lisbon is the capital of Portugal, once home to the greatest explorer Vasco da Gama. 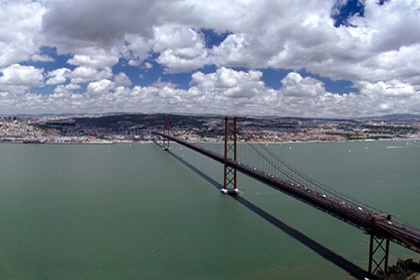 The city is set on the north side of the Tejo river. It’s the only European capital side by side with the atlantic ocean. Walking through the city you can observe historical boulevards and monuments rich in antique architecture such as Baroque, Romanesque, Manueline and Gothic. Several neighborhoods like Alfama remain since the arabic period back in the 12th century. All the current downtown area was completely rebuilt after the 1755 earthquake by the Marquês de Pombal. Our professional private transfer service will transfer you directly from Lisbon airport to and from any hotel, resort or private holiday villas/apartments in the city centre: Sofitel Lisbon Liberdade, Tivoli Lisbon, Tiara Park Atlantic Lisboa, Eurostars das Letras, Dom Pedro Palace, Hotel Real Palace, you name it. Use our website and take a look at our full list of taxi transfers fares & prices to all Lisbon areas.